The field was much as normal as the teams gathered at Brands Hatch for the first time in two years. Pre-race testing had shown how much progress had been made with Didier Pironi lapping the track five seconds faster than the best lap in 1978. The entry list was bolstered by the appearance of RAM's British F1 Championship team of Rupert Keegan and Desire Wilson with old Williams FW07 chassis. Brabham had dropped Ricardo Zunino and taken on Hector Rebaque while there was much interest in the new Fittipaldi F8, although Keke Rosberg had to make do with a modified old car while Emerson Fittipaldi used the new model. Qualifying resulted in Pironi taking pole from his Ligier team mate Jacques Laffite. The second row was shared by the two Williams's of Alan Jones and Carlos Reutemann while Nelson Piquet put his Brabham in fifth ahead of Bruno Giacomelli's Alfa Romeo. Ferrari and Renault were both in serious difficulties with tires with Jean-Pierre Jabouille 13th on the grid, Rene Arnoux 16th, Gilles Villeneuve 19th and Jody Scheckter 23rd. At the start Pironi took the lead with Laffite holding of a challenge for second place by Jones as they dived into Paddock Hill Bend. 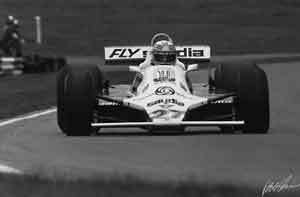 Piquet however was able to grab fourth place from Reutemann. As Pironi drove away from his challengers the race order remained the same until lap 17 when seventh placed Giacomelli pitted for new tires. Then Pironi began to slow and on lap 19 he went into the pits with a flat left front tire. The pit stop was not a success and Pironi rejoined at the tail of the field. He began a remarkable charge. At the front, however, Laffite was comfortably ahead until lap 31 when he began to suffer a deflating tire. This exploded and Laffite spun off into the catchfencing at Hawthorn Bend. This left Jones with a good lead over Piquet and Reutemann while Pironi provided the excitement as he worked his way up through the midfield. He was up to fifth place when he suffered another tire deflation. It was later established that the problems were being caused by the wheel rims cracking. Jones finished 10 seconds ahead of Piquet with Reutemann third. Derek Daly did a good job to finish fourth for Tyrrell while the top six was completed by the second Tyrrell of Jean-Pierre Jarier and Alain Prost's McLaren. The result gave Jones a six point lead in the World Championship over Piquet.